Neck pain, shoulder pain, and upper back pain can be related to an injury or medical condition in the cervical part of the spine, which can be treated with chiropractic care, depending on your condition. Chiropractic Care for neck pain may benefit you more than you believe, and you can find chiropractic care near you using the Chiropractic Guide. This is an image of an unspecified human with the right arm bent, reaching and hold the neck, where the image is highlighted to signify neck pain and upper back pain. “When the head is allowed to roll forward to one side or backwards for too long, neck muscles and ligaments get stressed, and neck pain that can extend into the upper back and arms is often the result” (acatoday.org, 2016). Chiropractic Care for neck pain that was caused by a neck injury or medical condition may benefit you more than you believe. Neck pain, shoulder pain, and upper back pain can be related to an injury or medical condition in the cervical part of the spine. From severe whiplash to a herniated cervical disc, there can be several reasons for a person to experience a pain in the neck. The type of treatment a person decides to receive may determine the length of time that an injury or condition will affect them, and a person may end up paying more for traditional medical care compared to chiropractic care, which can produce similar results. Fortunately, the Chiropractic Guide can provide you with the resources to find chiropractic care near you. A chiropractor near you offers cervical spine adjustments to patients to help relieve pressure and tension from the affected areas in the upper body. As it turns out, neck pain is closely related to pain felt in the shoulders and upper back since the nerves in the upper body may all be affected by an injury or condition. “When the head is allowed to roll forward to one side or backwards for too long, neck muscles and ligaments get stressed, and neck pain that can extend into the upper back and arms is often the result” (acatoday.org, 2016). 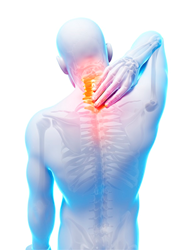 Most chiropractors have helped many patients find pain relief from whiplash after an auto accident. Nobody likes to live with pain, and whiplash isn’t something that should be taken lightly. Damaged nerves and muscles in the neck area can have an enormous impact on a person’s quality of life and may even cause long-term pain, depending on your condition. Whiplash is one of the most common causes of chronic neck pain, and studies have shown that it affects approximately three-fourths of individuals involved in auto accidents. According to research published by the US National Library of Medicine National Institutes of Health, approximately 45 to 85 percent of people who suffered from whiplash after an auto accident continued having symptoms for as long as five years after the crash (pubmed.gov, 1996). Many patients seek chiropractic care after suffering from an injury caused by an auto accident for longer than usual. In fact, many patients are also looking for alternative measures as a way of avoiding prescription pain killers that were provided by their regular physician. The National Institute on Drug Abuse reported that “the United States makes up 5% of the world’s population and consumes 75% of the world’s prescription drugs,” and the most commonly prescribed drugs that are abused include painkillers, tranquilizers/depressants, and stimulants (drugabuse.gov, 2015), which are typically prescribed after an auto accident. However, with chiropractic care and certain joint adjustments from a chiropractor, pain relief is possible for most patients with neck pain since the root cause of the pain is likely linked to a subluxation in the body that is affecting the nerves and causing inflammation. The American Chiropractic Association indicates that a “neck adjustment works to improve the mobility of the spine to increase range of motion, while also enhancing movement of the adjoining muscles” (acatoday.org, 2015). Whether your neck pain is caused by whiplash after an auto accident, a medical condition, or any type of injury, a chiropractic adjustment may help to relieve the pressure in the neck that is causing pain in other areas of the body, including the shoulders and upper back. In fact, a cervical adjustment may even keep you out of the emergency room and off the prescription pain medication. If you’re searching for a chiropractor in your area who can help with neck pain, visit Chiropractic Guide to search through our directory for a chiropractor near you so you can schedule an appointment for a consultation today. To learn more about the benefits of chiropractic care for neck pain, shoulder pain, and back pain, go to Chiropractic Guide to find a chiropractor in your area. Visit CHIROPRACTIC GUIDE to find a chiropractor in your area.